Universities in the West Bank and Jordan ranked the top ratios in passing the recent medical exam, which its results showed concerning figures about the success rates of students in the former Soviet Union, according to the results of the Israeli Ministry of Health shown in the 48 news site that has submitted the last union exam, about 49 graduates studied at Al-Najah University in Nablus and Arab American University in Jenin did the union exam 46 of them passed the exam about 94%, and 33 graduates from Jordan did the exam and 30 of them passed the exam about 91% which are the highest ratios in the Israeli Ministry of Health, followed by Hungary 85% and Germany 72%. But for the concerning results, that was from the former Soviet Union which had the highest number of graduates who applied for the union's exam, and the lowest percentage of passing the exam. From Moldova where 299 graduates did the exam only 92 graduates succeeded about 31% meaning that more than two-thirds Moldova graduates failed in the exam. From Ukraine 251 of its graduates did the exam and only 65 of them passed about 26%. The same situation with Romania 244 graduates took the exam only 71 graduates passed about 29%. The lowest success rate was recorded by the Armenian universities where 244 graduates from its universities did the exam and only 2% passed, followed by Russia 190 graduates did the exam and only 28 passed about 15%, while Belarus has a 22% success rate. 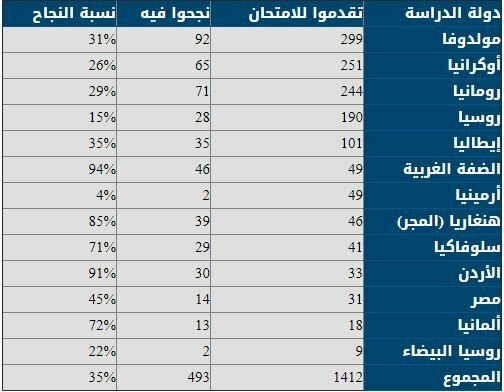 The number of graduates from Egyptian universities were also a surprise, where 31 graduates did the exam and only14 succeeded about 45%, higher than the Italian universities 100 of their graduates did the exam and only 35 passed about 35%. In recent years, there has been a large number of students from the 48 Palestinian territories studying in West Bank, Jordan and the former Soviet Union, especially Moldova, where students can easily study in Moldova but face great difficulties not only succeeding in the profession exam. Last week for example the Israeli Ministry of Health warned Israeli students at At the University of Tstmitsiano, Moldova that are1,300 student that they may not be able to apply for the professional examination once they return to the country due to insufficient exposure of medical students. The Israeli Ministry of Health said that the university students that are 2,000 students are being taught in a single hospital in the capital that does not have more than 600 beds, meaning 3 students per patient.